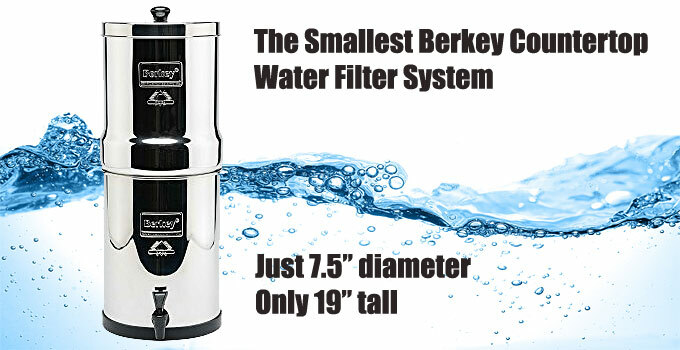 Berkey makes five different models of stainless steel countertop water filter systems. If you are looking for a high quality water filter for countertop or tabletop but you’re concerned about losing counter space, the Travel Berkey may be the right choice for you. The Travel Berkey is the smallest of their countertop / tabletop models. The Travel Berkey, being just 7.5 inches in diameter may be perfect for an RV or trailer while out camping, traveling, at the cabin. Great for small apartments or anywhere where space is at a premium. The most popular Berkey model size is the ‘Big Berkey’ (see it here). However I do really like the Travel Berkey. Because it filters 2.75 gallons per hour, its compact size (compared to the bigger model sizes) is fine for most, in my opinion. If you have a big family, then sure the Big Berkey is probably the way to go. – 2 black elements will filter 6,000 total gallons! Regulars on this site know how much of an advocate I am for having drinking quality water filters. A countertop model and a good portable water filter. Even though that water source may appear to be pristine, there is always a risk of invisible pathogens that could get you very sick. Giardia parasites comes to mind… If you want to be grossed out, see what they look like. As far as preps and gear are concerned, I place a high quality water filter at or near the top of the list. Don’t count on your water source to be pure. Run it through a filter! Our bodies are made up of about 75% water! What does that tell you! I agree, a GOOD!!!!!! water filter should be the number one item on your Preparedness list. As a sad note, over 5000 children die EACH DAY from bad water. Now that Stat of course is world wide in some fairly nasty areas, BUT how long will it take for ‘your’ water to “go bad” if/when??? Remember 3 days without water, a week with “bad water”. I wonder if Berkey will develop a filter to remove radiation. Does anyone make such an item? Wow Ken, thanks. I guess its been a while since I last researched, I didn’t realize there were so many options available. One more thing I NEED to spend money on. In truth the prices in that link seem very reasonable. I may post a revenge post listing everything I have bought. Make some of you spend money instead of me keeping an Amazon employee paid. Some weeks I spend enough to keep 3 of them employed. Between ham radio toys and prepping it’s a wonder I have any money left. Ken has spent a LOT of my money, and I’m happy to do it every time. We have this filtering system. The one we purchased said ‘not for well water’, so those are interested make sure you are purchasing the correct Seychelle for your usage. We do like this unit as a back up, an will order the correct Seychelle system along with lots of filters. Be sure to read the instructions as they only will filter about 25 gallons of the contaminate water before you have to dispose & replace the filters. I was looking at this product: Seychelle EXTREME Canteen filters Radiation, Viruses & Bacteria 38oz. However seems to be a contradiction in the description. Can someone help? Judging only by the words used, it can be used with river water as long as there’s no salt. Estuaries and streams near the sea often have high levels of salt even if they’re flowing. You’re missing the definition of ‘brackish water’. They’re not saying river water. Brackish water has salt in it. Evidently this will clog their filter. A river that flows into the ocean will have salt in it to an extent up the river. Depends on the flow and the river or estuary itself as to how far up the salt water mix will extend. Radiation in water is mostly a problem of sediment, that has particles in it like dirt and debris that have been exposed, let it settle to the bottom and gently skim water off the top. I have one of these with 2 of the Berkey Fluoride filters installed on it. I live in a suburb of Toledo Ohio and a few years ago Toledo had a problem with algae bloom on Lake Erie and it got into their water as their water filtration would not filter it out. I live in Oregon Oh (right next to Toledo) and Oregon has it’s own filtration plant and we had safe water so it was not a problem for me. But things can change and I called Berkey and got the added filters to remove the algae toxin. According to Berkey Guy the Fluoride filters remove the algae toxin. Also talked to Katadyn and got a add-on filter to remove toxin. It is an in-line carbon filter. I also have a Doulton counter top water filter, a Katadyn Pocket Filter, Katadyn Hiker a portable Berkey, sawyer water filter and 3 Berkey water bottle filters. So far I have not used the Doulton, the Sawyer or the Berkey water bottle filters, but they are there when I need them or to help family as none of my family prepares at all. Food, water, shelter, guns are all a first priority for any prepper minded person. Good to know. I was under the assumption that he only way to get of the toxins was reverse osmosis or distillation. I figured the filters would remove the algae but no the toxins. I know this is an article on Berkey Filters, but for a GREAT ‘small’ filter (backpack size) take a look at the Mini-Sawyer, very nice units also. I have 2 of the Mini Sawyer filters, They are only $20.00 at Wally World in the camping isle. At this price there is no excuse to not have a good water filter. They screw onto just about every water bottle made be it the 2 litter down to 16 oz and smaller so they are very adaptable to use. I’ve got them in all vehicles and bags. I’ve had the Travel Berkey for several years and I do like it. As you can see it doesn’t hold a lot of water and so I fill it daily. I don’t know if the next size up would be better or not. I can’t see that it would take up much more space on the kitchen table. I’m so far down the food chain from the rest of you that I don’t usually get into the product bragfests during the week, but I actually have one of these Travel Berkey filters! Woo-hoo! I’m coming up in the world! And I just got in a pair of standby replacement black filters for it to have on-hand in case I break one (or both). Now, if Ken runs NRP’s article about the best sewing machine to use for each task, I’ll be posting model numbers with you. HAHA! We use our Berkey filter daily to filter the city tap water for the wife’s drinking water and ice cubes. Keeping it in constant use makes me think that it will be ready when we really need it. Our tap water is fairly good, but it does flunk a test every now and then. If there’s a major problem and we have to go to the lake to get our own, the Travel Berkey should fit the bill for the two of us. I drink water straight out of the tap because I like living on the edge, I guess, but I will use Berkey filtered water if I think the city has had to work on the water main coming to our house. Heck, the water lines in our old house (moved from a farm in the 1940s during the WWII Army Airfield days) are probably something more to be worried about. Still, even with the old water mains that have been patched for years and old house plumbing, if I kick off, at least I may not die from some Chinese chemical in the new plastic pipes that would replace them. Ill be looking forward to that article on sewing machines! Nailbanger – Me too! NRP said that he wrote an article about treadle sewing machines a while back when I wrote one, and I’m hoping that was his subject. We use ours daily for all drinking water (and ice cubes). By the way, the ice cubes come out crystal clear! I’m not doubting the ability of the Berkey in a grid down situation. But why would you settle for a filter system like the Berkey when you could have a reverse osmosis system that is capable of so much more in your house? I could see the use of a Berkey if you had no means of making water pressure and you wanted a gravity filter, but in the mean time an RO system with a Ultra Violet light provides far more protection and sterilization than any straight single filter system. I know there are some real Berkey fans out there, but for household drinking water, why go second best with a single filter system? That said, RO is fantastic for permanent fixed installation with power/pressure. Doesn’t reverse osmosis use something like 9 gallons for every 1 gallon of clean water you get out of it? If so that alone can make it hard to justify if you have limited water. Do i have to follow specific links to amazon for you to get credit? Or can i go there from any link on your site then search a product and get you credit? any of my amzn links. thanks. If i put stuff in my cart and dont buy it right away does the credit still go to you? If you put it in your cart via my link, it’s good for 90 days. Otherwise 24 hours. Thank you. A steady diet of RO water is not healthy! The process strips the good and bad from water. I believe there are secondary treatments that add minerals (good stuff) back. That’s the first acessory that I bought. It’s a great convenience.